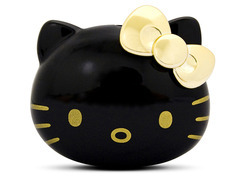 Hello Kitty gets a black and gilt makeover in one of the most stylish mp3 players I have seen a while. This cat gets around. Where most personal media players look like small mobile phones or packets of chewing gum, this stands out as something at once cute and classy. I’m almost sorry to tell you about this because it’s only available in Japan, from a company called iriver. But fingers crossed for the new year. Looking more like expensive after-dinner chocolate than most Hello Kitty merchandise it comes with matching gold-ringed ear buds. 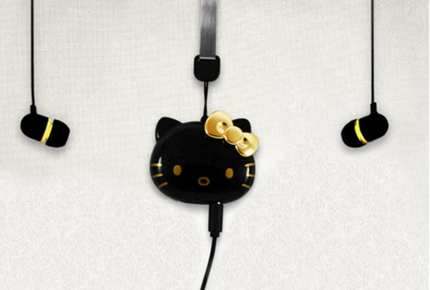 The Hello Kitty MP3 player is more of a style statement than a personal audio powerhouse, it comes in just 2GB and 4GB storage varieties, with a USB cable, ear buds of course, and a cute little lanyard for attaching it to things like your beltloop. This is very much something to be worn out like the jewellery that is, and not tucked away in a pocket. You can even change the Kitty’s hair decoration accessories, alternating between gold flowers and a gold bow. Can’t do that with an iPod can you?